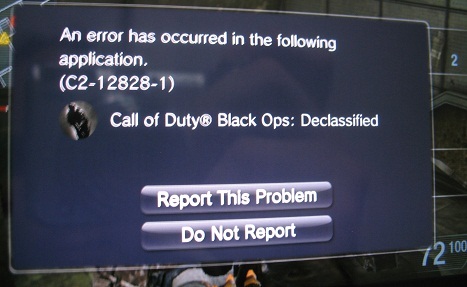 Everything about Black Ops: Declassified exposes a lack of developer effort. It seems that at no point did anyone at nStigate think about the overall quality of the game that was being made—concern obviously rested upon satisfying Activision and how much money would be raked in. Profit margin is maximized by this game having the huge marketability of the Call of Duty name, yet the product itself having required no amount of give-a-damn. Take the AI, for example. It might be the dumbest I’ve seen in a shooter. Ever. The screenshot below is my own, taken with a camera because the game does not allow screenshots from within (gee, I wonder why). I of course had all the time in the world to take this photo, because the enemy on the balcony was crouched down firing his gun into the wall… again and again, without stopping. Just… just firing away “at me” while I grabbed a camera and took a picture. Imagine going in for a hockey breakaway and being stopped by a goalie who is reading a magazine and talking on the phone. That’s similar to the idea of this guy trying to shoot me. The real killer, here, is that this type of thing doesn’t just show up once or twice in the game—it’s extremely common. Most shooters of this generation have been built with a short-to-medium-length single player experience, but achieving longevity through multiplayer modes; Black Ops: Declassified is no different, there. To this point, the Call of Duty series has provided decent single-player campaign modes, often with surprisingly gripping stories and memorable endings. It’s been five years since playing through Modern Warfare, but two moments from the campaign remain with me as if I’d just seen them yesterday, for example. Don’t prepare for any such moments in Black Ops: Declassified, however, as the story told gives off the distinct odor of fan fiction with how simple it is. Take the names of two Black Ops protagonists, slap them on some extremely cookie-cutter “rescue these people” and “get to this place” missions and you’re set. While billed as a connection between the two Black Ops console games, it filled the space about as well as a few cinder blocks dumped into the Mighty Mississippi. Perhaps a short campaign was expected, but to have one this short and this poorly made is a terrible failure and a disservice to customers. Only 10 missions are present, the average length of which is about five minutes, and they fail to deliver any sort of narrative. Graphics and controls might be held back on a handheld, but telling a story is an area that definitely does not have to be dwarfed due to technology. It doesn’t have to be, yet it was. At times, during the campaign, control will be taken away in order to remind you that you’re not connected to the network. 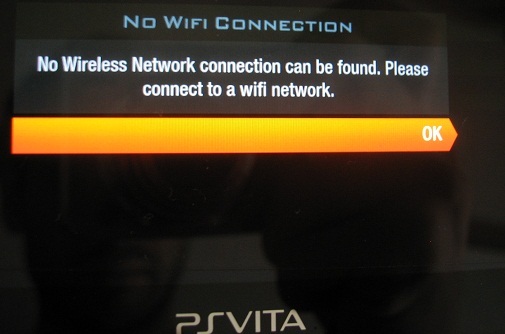 No joke, whether you’re checking menus or right in the middle of a fire fight, a message will pop up on the screen to tell you that you’re not connected to a network. Seeing “Mission Failed” on the screen is surely worth being reminded that you’re still not connected to the internet, right? That’s broken and shouldn’t happen, ever. Within almost any good shooter, a variety of multiplayer maps both big and small will be featured, giving players a taste of open-space shooting as well as close-quarters combat. 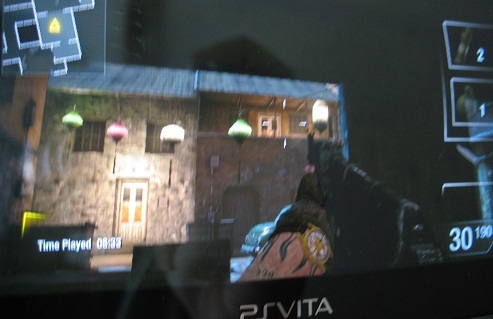 CoD:BOD, however, is not a good shooter and therefore skips numerous possibilities with its scant selection of multiplayer maps and microscopic size of some of them. There’s almost not enough space to respawn in some of them, and players will see people reappearing before their eyes much more often here than in other shooters (handheld or not). Conversely, they’ll respawn with someone directly in front of them, within kill range. While it can provide laughs with friends, the emphasis on luck quickly becomes apparent. Small maps can be fun and frantic, but Declassified‘s take on small maps crosses the line into being too small. 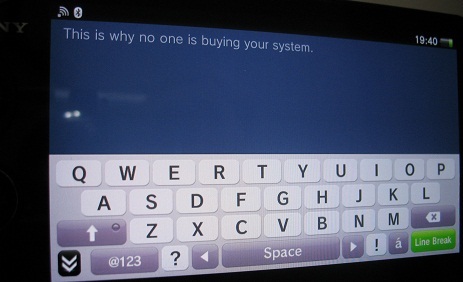 The problem isn’t that it fails to replicate a console experience—that’s not the expectation of a portable—the problem is that it fails to even provide a good portable experience. The hallway-style shooting gallery provides entertainment that dwindles after a day or two. It’s fun in the same way a phone game is fun, and that’s quite frankly not enough to be on this system for this price. There will undoubtedly be those who enjoy Declassified on the grounds that multiplayer is all that matters to them, and to these folks, hey, enjoy. Feeding Activision money for this blatant exploitation ensures that more will come. Truly, if there’s one good thing to say about the game, it’s that it does indeed provide some multiplayer fun. Despite the lack of polish, lack of options, and high amount of disconnection, there are some good times to be had in the online play. It won’t last too long, but what’s there is decent. It hurts to see, however, that this was clearly just the start to what could have been something truly great. The game’s first patch makes ad-hoc multiplayer available; most gamers won’t be using this, but the inclusion is nice. Really, any game that has online connectivity may as well also have local connectivity. The fact that there aren’t yet many Vitas in the hands of gamers isn’t really Activision’s fault so much as Sony’s and certain other factors. Although, having said that, with an actual effort put into making this game good, perhaps Activision and nStigate could have helped solve that problem. Instead of being a system seller and shining star among the Vita software lineup, Black Ops: Declassified turned out to be the one of system’s biggest embarrassments. Discussing a score within a review is usually unnecessary, but this is a special case in which I feel I should address the giant 1/10 at the bottom of this page. People who take these numbers entirely too seriously (a group that does not include me) will look at it with a magnifying glass and say that there is something good about the game, and that I in fact like this 1/10 game slightly more than other games I’ve given 2s or maybe even 3s. This is getting a 1 because it is a crime against gaming. It is a subtle message from Activision that it, as a company, believes that you, the game-buying public, are a bunch of extremely stupid people. This game has the first pieces necessary to become a good, well-made experience, but it was obviously rushed to the market to make that sweet, sweet Christmas money. Rather than add a few more multiplayer stages, fix the glitches, fix the connection problems, write a story that might matter to Black Ops fans, add at least a few more campaign missions, and tweak the AI a bit, they released the game in this undercooked state. There’s no excuse for that. Those people making these release decisions believe that you will buy an incomplete product. They believe that you will do it, and your image of them will not be tarnished so much that you approach their future products with any degree of hesitation—kind of like what Square Enix did with Final Fantasy XIV. They believe, in so many words, that you don’t think. That’s messed up. Thinking that you are smarter or better than your customers isn’t good business, and neither is releasing a game in this condition. Cookie cutter mission objectives and no life to the story. Low selection of multiplayer stages, and many are too small. Small stages lead to general lack of strategy in multiplayer. Disconnection rate seems oddly high compared to other online games for Vita. Crashes, glitches, overall a sloppy product. There are free games, phone games, and PSP games that provide overall better experiences than this, and for a lower cost. If you buy this, you are part of the problem.